While in Rwanda for a study abroad program through the School for International Training (SIT) I met Sasha Fisher, the Executive Director for Spark MicroGrants. I was intrigued and inspired by her description of Spark’s work and got a chance to work with Sasha, Spark’s facilitators, and the recipient communities for a month. During the month, I decided to research the level of empowerment felt in one of Spark’s microgrant communities. I chose to look at the level of empowerment because of the emphasis that is put on it in aid organizations such as the World Bank (who has entire books out about how to promote empowerment in development aid), USAID, UNICEF, and many more. Considering its emphasis, especially in microfinance, looking at the levels of empowerment is an important part of the evaluation process. One of my main attractions to the Spark method is their ability to let the communities truly create what they want for themselves with no strings attached. In my research, I explain a highly abbreviated history of development aid where I argue that international development aid has failed to develop Third World countries (see Dead Aid by Dambisa Moyo, and The Trouble with Africa: Why Foreign Aid Isn’t Working by Robert Calderisi). The main issue I cite is the “top-down” approach where the aid donors design and implement aid projects with little to no input from the recipient communities. Instead of designing projects for their communities, Spark embraces their innovation, their knowledge, and their potential to create highly sustainable projects that the communities themselves are invested in. 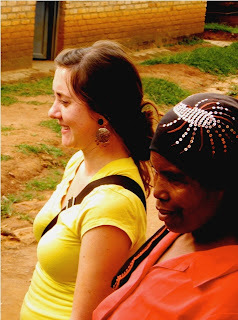 The community I worked with was a large women’s association (about 1,700 members) in Southern Rwanda called Ubtwari bwo Kubaho, which roughly means “heroes in living.” Through multiple community meetings, the women of Ubtwari bwo Kubaho decided to implement a goat project with their microgrant. Utilizing the Spark philosophy of community-owned microgrants, the women brainstormed projects, voted on one, created a proposal and budget, and implemented the project on their own, with minimal guidance from the Spark staff. Spark serves mostly as a guidance counselor and a conduit to grant money that would otherwise be out of the reach of people in rural Rwanda. The title of my piece, “The Third Wave of Microfinance: Microgrants and Empowerment,” was inspired after reading about the first and second waves of microfinance: the first in the 1970s and the second in the 1990s. I argue that the next wave has the potential to be found in microgranting in the Microgrant Revolution. Microgrants, unlike microloans, have the ability to fund public sector projects that cannot be repaid (like a water system, a school, etc). This is where microcredit cannot succeed, and it is where microgrants fill in the holes. Like the microfinance revolutions before it, the third wave of microfinance, found in microgranting, will not try to replace existing microfinance institutions. Instead, it can complement the existing structures and make up for its shortcomings. Microgranting and microcredit together can be a powerful and sustainable approach to community-led poverty alleviation. I found that in this instance the individual impact was very limited because of the large size of the group and the smallness of the project. Any tangible short term poverty alleviation was also minimal. However that isn't to say the project was not helpful. The community impact can be seen when we look at the process of getting the microgrant and how the process affected them by instilling a sense of ownership and encouraging creativity. Like I said, I believe that microgrants have the potential to be a highly effective partner to microcredit. While microcredit is focused on individual asset building, microgrants focus on public sector projects and community empowerment. Individually, they are both missing important pieces, but together they form a highly sustainable form of development aid. Hey Rachel, thanks again for all the work you did to get this information together! Really helpful as we work toward getting a more complete picture of the impact of microgrants.